Grass Fed Lamb...that phrase may have some appeal to many people...but possibly the least of all who it appeals to is the Shepherdess. How hard it was to take some of my Spring lambs to the Processor this morning. There's a few down sides to raising animals and this is one of them. With a sad heart, some tears and lots of reasoning - I said good bye to these beautiful animals that I delivered and have lovingly cared for these past 6 months. Instead of continuing to think of their future, I'm choosing to look at their past. Sadly for so many animals their short lives on this earth are bleak and pain filled. 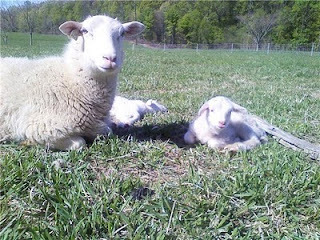 I'm thankful for little lambs who have content days full of frolicking in green fields next to their mother's side - never an empty belly or a hurt gone unnoticed and untreated.